Small yet powerful, the Oki B730 A4 mono printer is designed for small to large offices with high-volume printing needs. This quick laser printer has a monthly duty cycle of 200,000 pages per month. It can deliver professional output with a maximum resolution of 1,200 x 1,200 dpi and is equipped with a standard memory of 128 MB that can be upgraded to 640 MB. The Oki B730 laser printer does not come with standard duplexer nor Ethernet connectivity. This laser printer is cube-like, with an output tray on top and input trays as the base. The B730 workgroup printer has USB and parallel ports, a control panel with backlit LCD display, and function buttons. 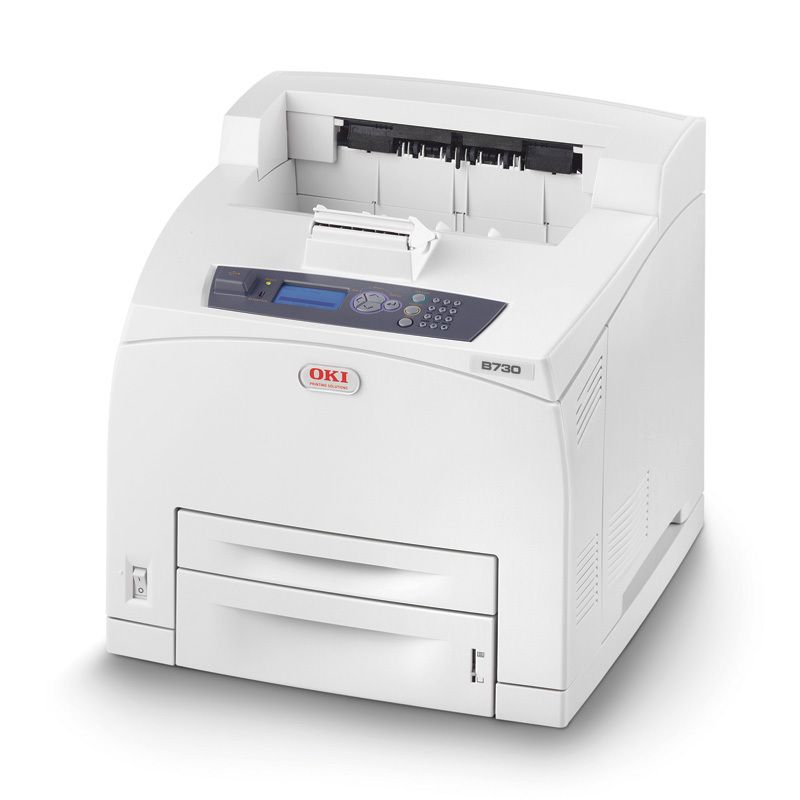 With optional trays, the Oki B730 mono laser printer can handle a total of 1,800 sheets. Print speed is an impressive 50 ppm for black and white output. The Oki B730 comes with a front panel USB port that allows users to print directly from thumb drives. This robust unit is very reliable and can deliver consistent images and texts. It is very easy to use and is compatible with both Macintosh and Windows computers. The Oki B730 mono LED laser printer is also very quick and efficient yet has low running costs, thanks to high-yield Oki B730 cartridges. The eco-friendly B730 is also certified with Blue Angel and Energy Star. The B730 printer could be better if it had a standard duplexer for automatic double-sided printing. The Oki B730 also lacks networking connectivity, but Ethernet is optional; Wi-Fi is not offered.